Exoskeletons are like armor for insects. Exoskeletons are outer body cases with flexible joints made of chitin, which is like natural plastic. Arthropods, who make up four-fifths of the world's animals, have exoskeletons. Exoskeletons don't grow, they molt or shed. While molting or shedding, the arthropods are vulnerable. Exoskeletons help animals in many different ways. For example, grasshoppers use exoskeletons to protect themselves. Stag beetle's exoskeletons take the form of antler-like mandibles, which not only protect, but also look cool. 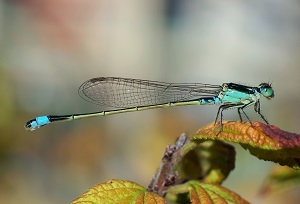 Damselflies show how flexible exoskeletons can be by using these protective shells to connect to each other to make a mating wheel. Exoskeletons are not only used by small animals, but large ones as well. For instance, the Japanese spider crab, with a 13-foot leg span, is the largest arthropod in the world. It has a calcified, but not hardened, exoskeleton made of calcium carbonate. Called a carapace, it is like a protecting crown. The crab's claws are so powerful that it can crack open shells. The Japanese spider crab can barely move on land without water. Exoskeletons are useful, so if you ever come across an animal with one, be impressed.